CreatorMe: A few cups of tea! A few cups of tea! I kept meaning to join the T(ea) Stands for Tuesday and had only been able to do it once! Sad! But I am going to do my best to join in more often. 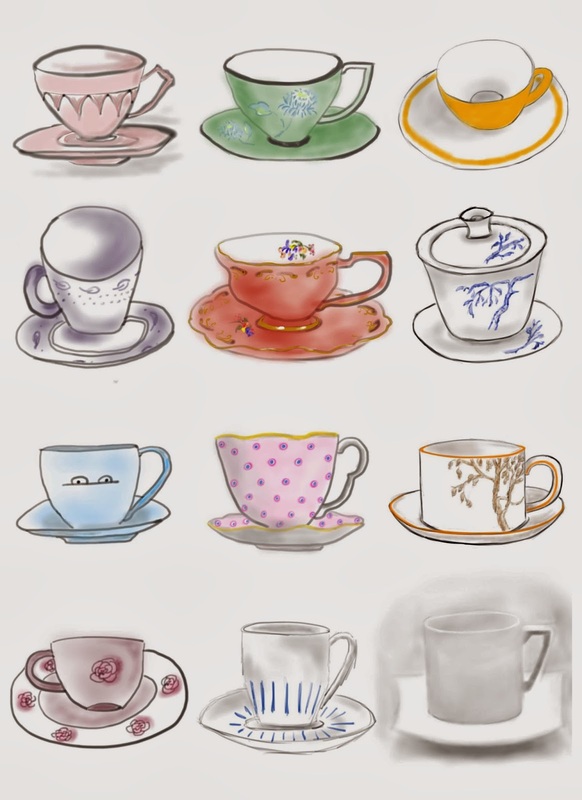 So I did a whole bunch of tea cups on one page. Why? Well, maybe any one or all of the following reasons. 1) to make up for all the times that I wanted to join in but missed 2) get a little ahead so I already made a whole bunch for the weeks to come 3) practice to just let go and not be such a perfectionist (so annoying sometimes) 4) keep practicing to have fun! I like those cups of tea! May I have the pink one middle third row please? It looks so dainty! Thanks and of course ... they are all here to share! So glad you joined us for T(ea) today, Myriam. You have a gorgeous set of tea cups. I am in awe of the various styles and colors you chose, and the different ways you chose to show them, too. I look forward to even more of these beauties in weeks to come, because if this is a preview, I'm ready to see even more. To think these were made digitally blows me away. Thanks for joining T(ea) today and doing so with your Sketchbook Pro. Thanks and I hope to join you all more often. LOL!!! Love your post and your page full of cups! Fantastic! Lovely tea cups. I'm glad you were able to make it for tea today...thanks for stopping by my blog as well! thanks Halle. It was fun visiting. Thanks for your sweet comments Dawn. your teacups are really wonderful! Wonderful teacups. Looks like someone's collection ready for a group of ladies to visit. Hope you can join us at T every Tuesday. Thanks Darla. Yup all set and ready for visits.